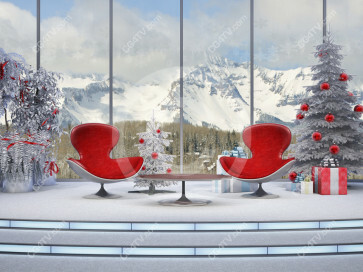 Our Christmas Virtual Set -- Camera 2 offers the perfect backdrop for a holiday discussion or interview. This is the one of eight camera angles afford multiple views of a cozy Christmas Virtual Set, with a wintry mountain scene in the background. Christmas Virtual Set -- Camera 2. It’s time to get ready for the holidays! Our Christmas Virtual Set offers the perfect backdrop for a holiday discussion or interview. Eight camera angles afford multiple views of a cozy Christmas set, with a wintry mountain scene in the background. Decorated Christmas trees and wrapped presents add to the holiday feel. Two anchor chairs are in the center of the set. Multiple viewpoints allow focus on both people or either one at multiple distances. Camera #8 fills the screen with a festive Christmas tree. Our 3D virtual sets are so realistic and of such high quality that they’ve been used in many movie and TV productions. But you don’t have to make a movie to capture the value of our Christmas Virtual Set. You can use it in your next holiday program, podcast, webcast, corporate or academic communication . . . you name it! The possibilities are endless. Our realistic, high quality, high definition Christmas Virtual Set gives you a million dollar look for a fraction of the cost of a comparable live set. With this Christmas Virtual Set you can focus on the talent from a variety of distances and angles. With our experience in integrating our sets into popular vr set systems, no matter what you use – green screen, blue screen or chroma key – our sets will fit your virtual production needs. Deliverables are in high resolution .png format providing ample room to pan and zoom to set up your shot. We offer discounts to returning customers, so you can save even more. Watch our letters for the coupon codes. Buy two of our animated camera sets and get the third free! 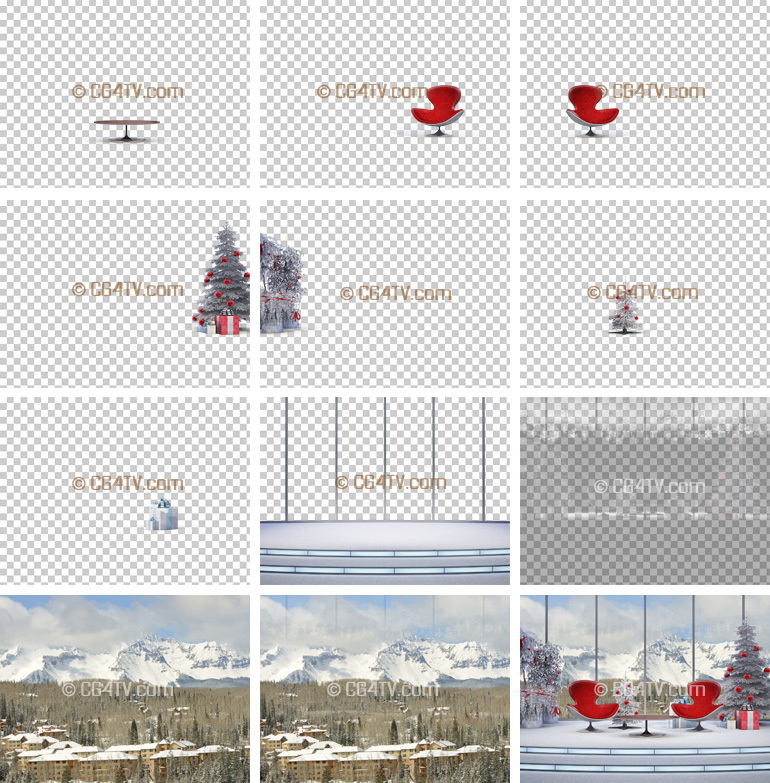 You can use the stock version of our Christmas Virtual Set or we can customize one for you. Or we can create an entirely new virtual set to meet your needs. All Our virtual sets are compatible with any professional video editing software, MAC or PC. And you can download a free test before you buy. That way, you can test your concept ahead of time and there’ll be no guesswork. Our virtual sets are only available from CG4TV.com. There are no resellers or representatives, so order your Christmas Virtual Set directly from us. With our Christmas Virtual Set, you can produce a holiday program from almost anywhere without spending time and money for custom CGI development. And given the sophistication of today’s audiences, actual physical sets with sufficient stage appeal cost a small fortune. So the choice is simple. Use our high definition Christmas Virtual Set for only pennies on the dollar. All our stock virtual sets are royalty-free, so you'll enjoy substantial savings over a custom work-up; and we're constantly adding to our stock virtual set collection. You're sure to find just the right virtual set for your needs. But if you don't see the one that fits your requirements perfectly, please feel free to contact us at info@cg4tv.com. We're always open to suggestions about additions to our stock catalog. All of the images and virtual sets here at CG4TV.com are available in a variety of sizes and resolutions to suit a broad range of requirements. Remember, the uses for our virtual sets are limited only by your imagination. CG4TV.com is your virtual electronic art gallery. Order your Christmas Virtual Set and download it now, with just a few simple clicks of your mouse! Download is immediate. We accept all major credit cards.